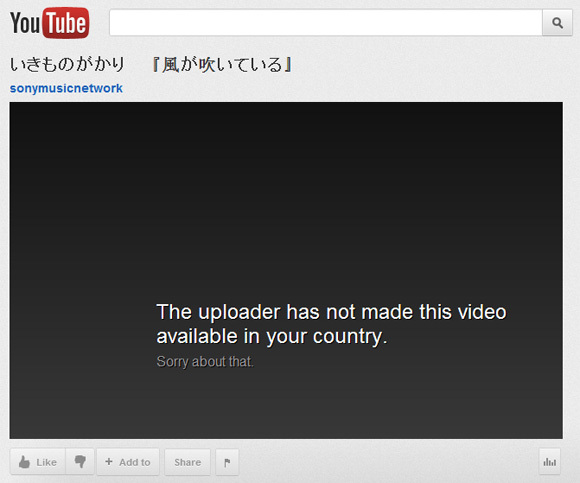 Sony Music Japan, You Make Me Suffer Sooooo Much | personal.amy-wong.com - A Blog by Amy Wong. I really want to love you, but I understand our complicated relationship. Every time I pull closer to you, you pull away, retreating to your closed existence where there is only fans of your music in Japan and you forget about me, who just like a person who can’t get enough of this mistreatment keeps coming back to you. I know I need therapy for this one-sided relationship we got going on. I am hoping that one day (soon, rather than later) you allow me to love you the way I want to. I don’t want ALL of you, I’d be just happy with short PVs… the one or two-minute clips other companies upload. I can deal with that, but not being able to even BROWSE your content while being able to see it uploaded on my timeline seems like an awfully unfair affair. I heard American suffer a lot with Japanese stuff. But Shiina Ringo is out of sony/columbia, so I’ve been able to see her uploads since, even though I heard US users have it blocked. But yah- I heard Euro copyright is a pain. Especially German.